How to connect computer to TV via cable (HDMI or VGA as recommended cable), and use television as an external display of your computer. Depending on the ports available on your television and computer, it is possible to connect your computer to television – using the television as a monitor. The following guide was designed to help you to connect your computer to your TV. Note: Before you proceed, it is recommended that you download the latest driver and software version of your graphic card. For more information visit your graphic card or computer manufacturer Website. Because almost every computer has an output port, you can use a cable to connect your computer to television. Most computers have a VGA output port, so using VGA cables is very common. Other recommended connection is via HDMI cable. The Video Graphic Array is capable of transmitting high resolution analogue video, but does not transmit sound. You will need to use the audio connectors of your device. * It is recommended to use a PC cable with ferrites, such as the “Connector, D-sub 15” (ref. 1-793-504-11, available in Sony Service Centre), or an equivalent. The High-Definition Multimedia Interface (HDMI) is an all-digital audio/video interface capable of transmitting high definition video and audio signals. However, not all HDMI-enabled video cards support audio. If your HDTV has an audio input, you might be able to connect a separate audio cable from your computer sound card directly to the TV. Otherwise, you'll need to connect the audio signal to a different device, such as external computer speakers or your home stereo system. If connecting a digital audio system that is compatible with Audio Return Channel (ARC) technology, use HDMI IN 1 (ARC). If not, an additional audio connection with is necessary to PC/HDMI AUDIO IN is necessary. You can connect it to the HDMI (with AUDIO IN) port through a DVI - HDMI adaptor interface (not supplied), and connect the device’s audio out port to the PC/HDMI AUDIO IN. This TV’s PC input does not support Sync on Green or Composite Sync. This TV’s PC input does not support interlaced signals. This information is based and tested on Sony VAIO computers. To obtain support for a different graphic card, please contact your computer and/or graphic card manufacturer. Click your computer graphic card manufacturer below to display the related information. Connect the selected video cable from the computer to the respective input of the television set. On your television set select the correct Input channel (i.e. : PC Input, HDMI 1, etc). Right click on the computer Desktop. On the appearing menu select [Nvidia® Control panel]. Alternatively you can click [Start] ---> [Control Panel] ---> [Nvidia® Control Panel icon]. Alternatively you can click [Start] ---> [Control Panel] --> [Nvidia® Control Panel icon]. Select the Multiple displays option. 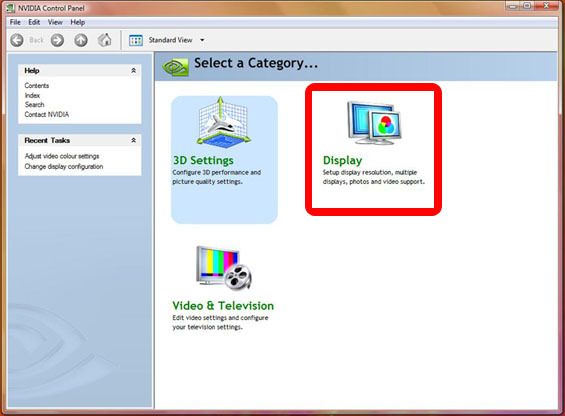 Single Display: Shows the image only in one of the displays (the computer or the television). For example to watch a movie on your television set using the computer as the video player. Clone: Shows the same image on the computer’s display and the television set. This mode is useful -for example- during bussines presentations. Dualview: Expands your working area to the external display. You can modify also the colour, the aspect ratio and resolution of your television and computer. On the "Select a display task..." menu, select the display to be modified. Modify the settings accordingly to the native resolution of your TV set (usually 1920x1080 or 1360x768). Apply the changes and confirm. Use Nvidia® Scaling: This option will use the scale selected in the graphic card. Recommended to fit the image as large as the TV set display with the graphic card quality. Nvidia® scaling with aspect ratio: This option will select the graphic card resolution but including black bars around the image maintaining the aspect ratio selected. Recommended when the image appears distorted when it fits the TV set display using Nvidia® Scaling option. Display’s built in Scaling: Uses the television scaling. Recommended if you prefer the quality of image that your TV set displays more than the one of the Graphic card. Do not scale: The image will be shown in the maximum resolution. Recommended when the image appears blurry using the previous 3 scaling options. Depending on the technical specifications of your device, you can also modify the aspect ratio using the screen settings options of your TV set. Please refer to the television manual. Move to resize the Desktop and apply. The name NVIDIA and the NVIDIA logo are registered trademarks of NVIDIA Corporation. On the appearing menu select [ATI Catalyst™]. Alternatively you can click [Start] on the taskbar ---> [All programs] and select [ATI Catalyst™]. Single:: Shows the image only in one of the displays (the computer or the television). For example, to watch a movie on your television set using the computer as the video player. Select your main display: The main display will be the one represented by the icon (computer or television) on the left side at the “Desktop and Display set up” menu . Position your pointer over the icon of the computer or the external monitor. Right click over the icon. Select the swap displays option. Depending on the graphic driver, some options might not be available. Please refer to you graphic card or computer manufacturer. Select the display to be modified by clicking over the icon. Select the Computer / Notebook Panel properties menu. Preserve Aspect ratio: Will show the image with black bars. Recommended when the image appears distorted at full screen. Full Screen: This option will use the scale selected in the graphic card. Recommended to fit the image as large as the TV set display with the graphic card quality. Centered: Displays the image surrounded by a black box. Recommended when the image appears blurry. On Displays Manager menu click over the television icon to select it. Use the arrows to adjust the position and/or size of the image on your television set and apply. On Displays Manager menu select the display to be modified. On the Graphic settings window, select Color Menu. Apply and confirm the modifications. ATI is a registered trademark of Advanced Micro Devices, Inc. in the United States and other countries. On the appearing menu select [Graphic Properties]. Alternatively you can click [Start] in the taskbar ---> [Control Panel] ---> [Appearance and Themes] ---> [Display] ---> [Settings tab] ---> [Advance button] select the tab [Intel® Graphics Media Accelerator Driver] and click over [Graphic Properties]. Alternatively you can click [Windows logo] in the taskbar ---> [Control Panel] ---> [Appearance and Themes] ---> [Personalization] ---> [Display settings] ---> [Advance settings], select the tab [Intel® Graphics Media Accelerator Driver] and click over [Graphic Properties]. Single Display (marked with red):: Shows the image only in one of the displays (the computer or the television). For example, to watch a movie on your television set using the computer as the video player. Multiple Displays:: Shows the image on both computer display and television set. Clone: Shows the same image on the computer's display and the television set. This mode is useful -for example- during bussines presentations. Primary Device: Select which of the connected displays will be the principal working area. After selecting the preferred option, click [Apply] and confirm. Select the display to be modified. To restore the original settings, click the [Restore Defaults] button. Intel and the Intel logo are registered trademarks of Intel Corporation.